This is my 200th post! That means I have posted every week for nearly four years. Thanks to each of you who have been subscribing since the beginning and to those of you who have since joined in. I pray regularly that my posts bless my readers. I posted a very significant post at the 100 milestone. It fell on my birthday, of all things. I re-read my Birthday Manifesto with a tender heart. I could have written the same words again today. My heart has not changed. Now that an additional 100 posts are in the rear view mirror, I did some reflecting about why I have sustained this weekly habit for so long. For one, I appreciate having a productive place for my mind to go when I am tempted to ruminate on negative and momentary problems. When traveling alone in the car, I am usually listening to a podcast, praying, or thinking about the next post. These three pastimes help me live out Philippians 4:8: Finally, brothers, whatever is true, whatever is honorable, whatever is just, whatever is pure, whatever is lovely, whatever is commendable, if there is any excellence, if there is anything worthy of praise, think about these things. Second, I am not well-known in the world and do not have a job in full-time Christian work, so this gives me a place to publicly profess my faith. I hope all I do here provides an attractive light for Jesus Christ. Hi Laurie! …I love how your book leads others to The Answers, to the Lord’s word. Everyday challenges from small to large, He holds the answers and it is so clearly stated in this book. Our dot in eternity, how God shapes our lives, our story. To me I could relate to so many things which made me understand…and get it! For a busy mom with a full time job to be able to relate, to be able to place the Scriptures in everyday life experiences, helps me tremendously and pushes my desire to continue to read, to learn and to dig deeper in His word. 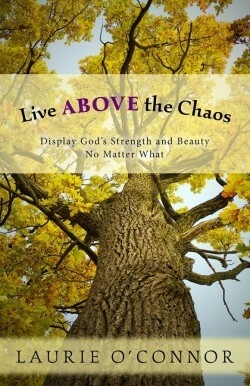 Live ABOVE the Chaos has helped me to see how I can grow with Him through all circumstances. 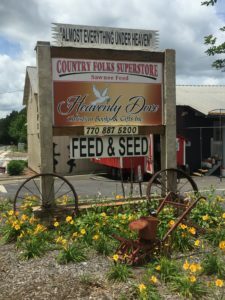 We are very blessed to have this book here at Heavenly Dove and look forward to a book signing…hopefully soon! First, learn about God’s big plan with history. What is God up to with the world, with history at large? Without such context, it is difficult to perceive accurately what we are seeing. Second, learn about how God views you (Perspective). What is your purpose? Why are you here? Why are you incredibly valuable in the world today? Third, learn how God grows you (Process). Understanding the way God matures our faith enables us to better accept the trials we encounter, for example, and to leverage them for His glory and our good. Fourth (and last), learn how to love people. All too often the church grabs new believers and sends them into immediate service to love a hurting world. That sounds good, but without the prior foundational pieces, none of us have the ability to offer the sustained, quality love the world needs to see and experience. We then wonder why we fail. If you haven’t picked up a copy yet, please do. 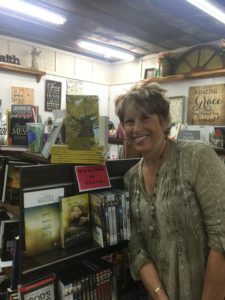 For those that can’t make it to the bookstore to purchase the book (which is nestled inside this Country Superstore) the cheapest way to buy the book is to e-mail me at laurieoconnor@oaksministries.com and I will ship the book to you from my home supply. Otherwise, please order from oaksministries.com or amazon.com. Summer Refreshment Series will run from June 10-August 12. Each week, this series will provide an excerpt from Live ABOVE the Chaos, selected specifically to encourage you in the heat of your summer months. As always, I will continue to insert current photos of what is going on in my life. I hope everyone has an amazing summer. May the break in routine open up new pathways for God to refresh your spirit and increase your understanding of how much He loves you. Picture Explanation: My son and I attend a Memorial Day service every year in a local city. 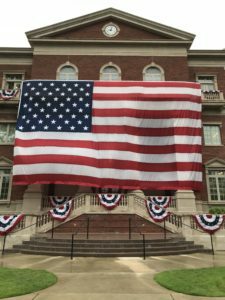 This week we traveled to Alpharetta, GA, which hosted the best small town Memorial Day service I have ever attended. God bless all people who fight for the freedom we enjoy, always willing to pay the ultimate price. And God bless all of the families of our armed forces who wait and pray that their loved ones come home. Congratulations on 200, Momma! Thank you for taking time each week to share God’s word. Congratulations! The “dot in eternity” perspective has always stuck with me and allows me to put my brother’s death in perspective. Think I may do a re-read of your book this summer.! I think of you and your family often. Stay blessed my friend. Hello friend. I have been thinking about you! So great to hear from you, and great to hear the “dot” idea has stuck with you. It’s been circling back to me lately as being something people remember. Be blessed, my friend. So sorry you lost your brother too. Hey, it’s part your story too, right? Thanks for letting me share it. I continue to love your honesty and vulnerability. When asked a question, you shoot straight. Proud to be your mom. 200! That’s a milestone! I admire your discipline but even more than that, I admire the WHY of your discipline! What a privilege it is to know you, to read you and to call you friend! Thanks for being the kind of friend that knows me well enough to know the WHY. The privilege is all mine. You are an amazing woman my friend. Thank you so much for giving away what you have to give and living all of it out right before our eyes! You are a treasure! Can’t wait to hear a service from your book all summer long. Rich we are with you as our friend! Thank you, my friend. Always messages of cheer. What does it take to pump out 200 posts without missing one? Faithfulness (meaning showing up and choosing to be full of faith), Grit (like a girl willing to let her hands get dirty), and being a woman who knows without Him she can do nothing! Proud of you, Laurie O’Connor. I’m always cheering you on! Congratulations on the bookstore selling Live Above the Chaos!